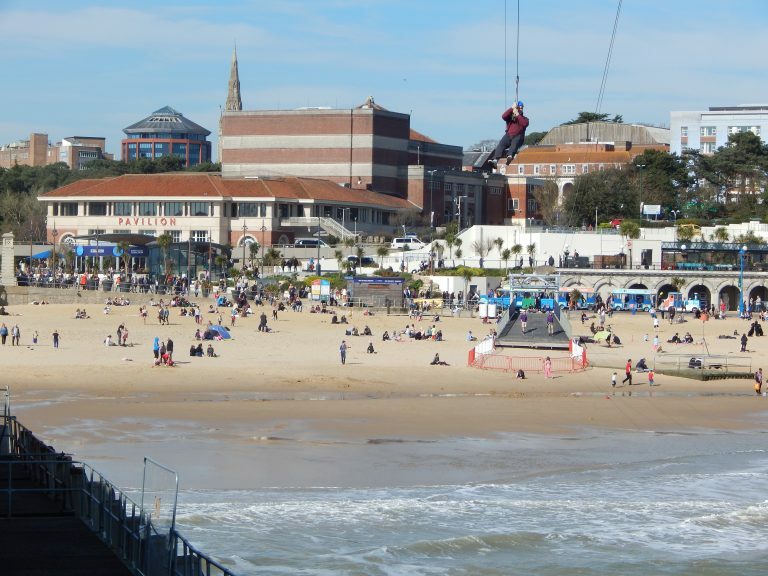 Bournemouth in the distance not sure who was going down the zip wire though! 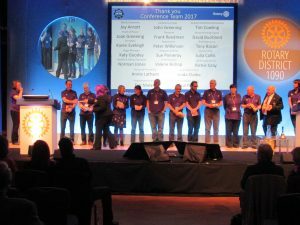 Every year our district which is in the Thames Valley holds a conference that never fails to inspire and entertain and 2017 was no exception. Members of Rotary from different clubs came together to celebrate the year and meet friends and make new ones. Our District Governor Joy and the conference organising committee did a fabulous job of reaching out to all of us and celebrating the 100 year anniversary of the Rotary Foundation. 100 years of doing good in the world is an incredible achievement. 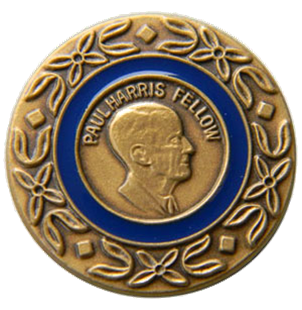 We had an update on what the clubs have been doing and met the Districts Rotary Scholars and found out how the End Polio campaign has been going. 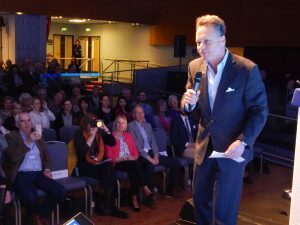 We travelled to Bournemouth on the 24th of March and went directly to the Bournemouth International Conference Centre for the opening of the event and to hear our first speakers at 15.00. Our conference was opened by the Mayor of Bournemouth Cllr Edward Jesser Coope and we were introduced to the fabulous Virpi Honkala Rotary Internationals Presidents Representative more about Virpi later. We then moved on to our first key speaker Professor Rachel McCrindle who talked about how Enhancing Communication and Independent living with technology, can help those with many different medical issues, especially after a stroke when being able to speak can be a major struggle. She talked about an application on a smartphone which has been developed to help the patient and the Drs understand each other it also has use in physical therapy for those with memory loss to remind them how to do basic things all very interesting. 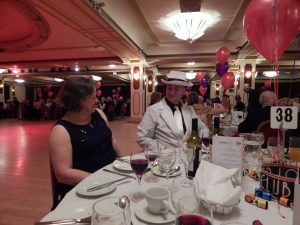 This was then followed by what the clubs in the district had been up to and celebrating all the incredible and inspiring events clubs have put on and projects they have taken part with. 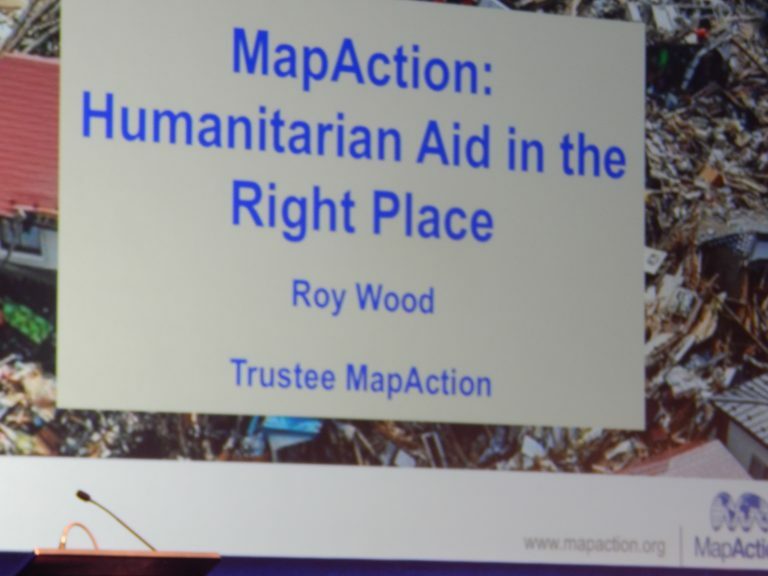 Rotary has many facets and when you see them all together it really is jaw dropping, our next Key speaker was a brilliant example of this, Roy Wood from the charity MapAction. MapAction is there for when a global disaster strikes, simply put they are the organisation which is there before the major charities can go into a disaster zone for example with the earthquake in Nepal before Shelterbox or the Red Cross could go in they send out information showing how and where it’s best and safest to access the area and get the aid needed in fast enough. Humanitarian disaster support is a massive operation and as I was sat there I realised that we only see the implementation after the charities have delivered aid to the right place. I had not even considered the heroic efforts of those mapping the areas and giving information after the disaster had struck and been then able to deliver a “Shared operational Picture” of the areas yet to be reached absolutely crucial in the world we live in today. The session then closed and we went back to our hotel and later gathered at the Restaurant our club president Katy had booked for us which was lovely we also had some of the district scholars join us too which made the evening. After the meal, we walked back and then some of us attended the evening entertainment which I understand was brilliant with Isabel Irvine RIBI young Musician of the year 2016 and followed by Richard Digance. So that was the end of Friday. Saturday the 25th came around and the sun was shining it really was a beautiful day the sky was blue and it was just lovely. I was up early as I was really excited to see after Friday what we had to look forward to. The second session started at 09.00 and we were all looking forward to it. Quite a few people had visited the house of friendship which was filled with many different stands promoting various different charities and organisations like the Air Ambulance and Guildford Eye Project. So the session started and we celebrated 100 years of our charity the Rotary Foundation one of the highlights of this section was hearing this year’s and past district rotary scholars tell us what they were studying what they wanted to do and impressively the huge and I mean massive amount of what they have achieved already and only in their 20’s and 30’s they have such courage they really do. The scholars thanked two members of the Scholars organising Committee with beautiful flowers which surprised both of them. We also heard from two of our Peace Scholars which was very interesting. They talked about peace and conflict resolution through poetry and stories and how important stories are to all cultures and how knowing them, can help achieve peace in different situations. This was followed by Dr Jim McWhirter telling us how Reaching out to hospitals in Uganda have made a huge difference. The story behind this project started in 2009 when he visited Kamuli Hospital, during that time he saw what a terrible state it was in with broken equipment that was unfixable and raised money with family friends and local rotary clubs to fix this and replace with a battery-powered x-ray unit which was shipped in 2009 sustainability is so key in areas which have trouble getting parts or have difficulty with electricity. In 2012 the busiest part of the hospital the maternity wing had to be evacuated due to termites and was declared unsafe. More money was donated to solve this major problem. Jim’s next project was to apply to the Rotary Foundation for a global grant to fund refurbishment and extend the maternity ward and convert and extend the operating theatre to form a new ward to the hospital the application was a success and in 2014 the building work was completed. Jim is now involved with training at the hospital which is very successful. 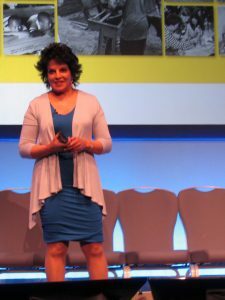 We were then introduced to the next speaker before the coffee break who had been through major trauma in the Paddington Rail Crash, Pam Warren. If you have never heard her speak, but get the chance in the future go and listen she is remarkable the word Can’t is not in her vocabulary she knows how “One person CAN make a difference” in the world and she certainly did not just to the other survivors but in raising awareness and not giving up till someone listened to them and they surely did. Her courage is something that I personally will never forget. Pam was the lady in the mask due to the awful burns she sustained in the crash. She truly is an inspiration and a wonderful speaker. We can do anything if we try! After Coffee, Joy our District Governor made all the presidents stand up for thanks for all they have done over their year as President, which was nice. We continued celebrating 100 years of foundation and then had the first part of a two-part session with Michael Angelo Caruso who spoke about the art of attraction and membership. He was brilliant making us laugh and understand how looking at something in a totally different way can make a huge difference and change the perspective not only of yourself but of the person you are talking to. Ruth Flint one of our past district scholars was surprised to find herself on stage having a conversation with Michael. You would never have known it was not scripted it was so well done. We broke for lunch and came back for part two at 15.00 when Michael opened up our eyes to Social Media Secrets with the assistance of the conference’s social media lead Paul Fisher who demonstrated the events live feed on Facebook and Twitter. There was also a Q & A session which was very useful. The emphasis on using the hashtag system was definitely needed especially for those who don’t use social media. It was a clear and a very light-hearted session but with the emphasis that social media is not going to go away anytime soon. 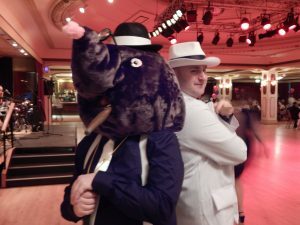 That, however, was not the end of our day, Saturday night was the night of the Gangster & Molls dinner dance in Bournemouth Pavillion. 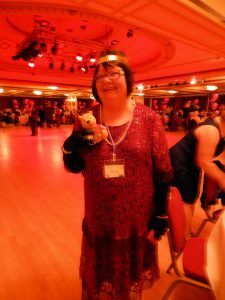 We had an incredible time everyone dressed in a 30s theme we even had a Gangster Mole turn up because according to the mole they can’t read very well or spell apparently and are partially sighted. In reality, the mole was the maroon area assistant governor who is indeed partially sighted with a good sense of humour! The band was excellent they were called Real Class and played a whole range of music for all the age groups in the Pavilion. The meal and the staff were great but you could not put a price on the friendship and fun we all had at that evening even Oxford Spires global travelling Winnie the Pooh got in on the act with having his photo taken with Virpi Honkala the Rotary International Presidents representative. By midnight we all were almost partied out and were taken back to our hotels by coach it was a great evening so much so we did not want it to end. Virpi Honkala and Pooh Bear RI Presidents Representative. Sunday 26ths morning came and with a heavy heart, we knew our celebrations of being together were coming to a close and that in the afternoon we were all heading home. However, the conference team had a few surprises up their sleeves still to come. So it was by no means over and done with! Sunday’s session started at 09.30 with a thank you to all the mums that were attending as it was mother’s day. 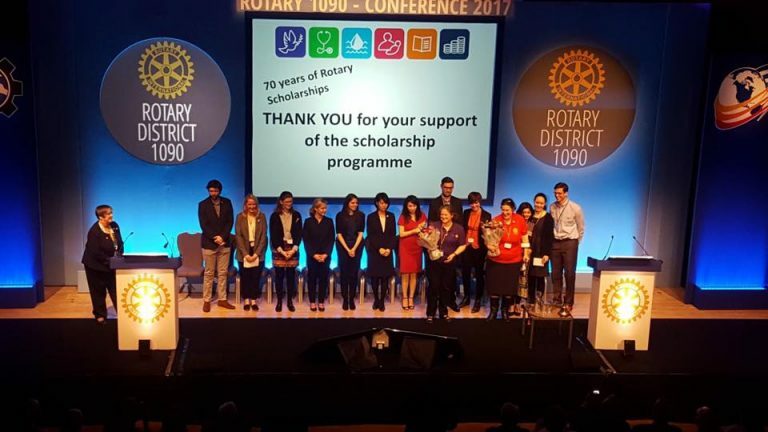 This was followed by the District Awards being presented and followed by a presentation by Rotaract and District 9 Inner Wheel Chairman Linda Clarke giving a short summary of what they have been involved with over the year. This was followed by the first of our three key speaker’s actress Jenny Seagrove and star of the new film Another Mothers Son. 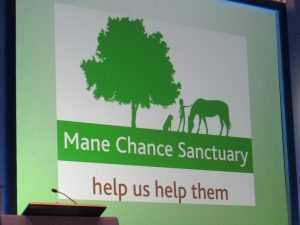 But it was not about her acting career she came to speak about it was about the Mane Chance Sanctuary which she is the founding trustee it is a place that not only helps horses that have been badly treated to recover but t also helps people with disabilities to have contact with the horses so that with Mindfulness they in effect help each other and connect. There is much more to it than just that simple summary and the video on the sanctuary’s web page can say more than my words can about the great work they do there. https://vimeo.com/92503454 (will show you the link) Jenny’s charity reach out to defenceless animals. 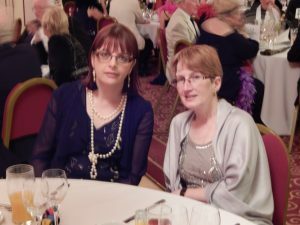 After Naomi spoke to us we were delighted to hear from Virpi Honkala & Rotary In Britain and Ireland President Eve Conway who emphasised the Purple 4 Polio campaign and gave us all the latest updates nationally and internationally. We then had District Governor Elect David Pope give us a little taster of next years conference in Cheltenham. Our final Key Speaker was someone who grew up in extraordinary times and managed to survive despite all the odds. 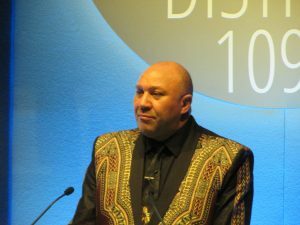 Chris Lubbe “A journey from Apartheid to truth and reconciliation” Chris was one of Nelson Mandela’s body guards and told us his story of growing up in South Africa during those dark times. He had us held in his hand while he was speaking as he like our other speaker this weekend spoke directly from his heart. We were moved, we laughed with him we cried with the sadness he went through. Chris spoke to each one of us and it is something I am certain none of us will ever forget. To have met Nelson Mandela is one thing but to have lived through Apartheid and come out of it knowing that reconciliation is the way to peace is incredible. Chris Lubbe is an advocate for peace. http://www.chrislubbe.co.uk/ for more information. we could have listened to him for much longer so it is not surprising the whole room gave a standing ovation. It’s impossible to follow that, so we had all the conference committee come out on stage from behind the scenes and take a bow. It really was an exceptional weekend. Personally, I can’t wait for next year as the huge amount you learn at events like this is beyond any price.